We have a fantastic lighting rep from Stan Deutsch, fantastic because he schleps real live fixtures to our office to demonstrate the fantastic possibilities of lighting. And today in addition to bringing me a lighting geek from Cree, Inc. who waxed enthusiastic over the LED troffer light he was demonstrating, he suggested we have lunch afterward. I started with the usual list: Thai, Mexican, tacos, pasta, pizza, Malaysian, Chinese and at the end I threw in lobster rolls. Well that perked them both up and we ended up at Ed's Lobster Bar for some satisfying lobster rolls. 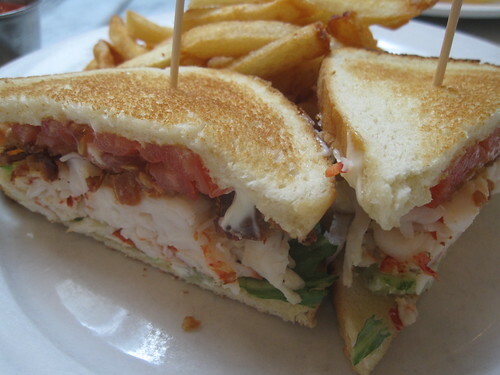 On a lark I tried the lobster BLT, which was good, but not as satisfying as I find the lobster rolls.